The choice of antifungal drugs on the market is small, and there are limitations on which ones the NHS can prescribe. Many strains of fungus have evolved resistance to multiple drugs, and harsh side effects mean some patients cannot tolerate certain drugs, so there is a desperate need for new antifungals, ideally from new classes that are not yet affected by resistance. Learning about the disease and looking for molecular targets for new drugs to be used against. Drug discovery Screening libraries of chemicals, or tweaking the structures of promising compounds. Pre-clinical studies Testing how well the potential new drug works in a test tube or animal model. Phase 0 and I Testing the drug in healthy volunteers, to see what happens to the drug inside the body - how well is it absorbed into the bloodstream, distributed to the relevant tissues (e.g. lungs), metabolised and eliminated through the urine/faeces. This helps the researchers decide what range of dosages to use in the trials. Phase II Testing the drug in several hundred patients with the condition, to see which dosage is most effective and get an idea of any common side effects. Phase III Testing the drug in several hundred to several thousand patients with the condition, to accurately measure how well the drug treats the disease and how often it produces each side effect. Application for drug approval Applying to the EMA (Europe) or a country-specific medicines regulatory agency such as the FDA (U.S.) for permission to start selling the drug. Commissioning/funding If NICE do not recommend a drug for routine use (which has been the case for many antifungals), a doctor can still prescribe it to a patient if their local CCG agrees to fund it. The NAC is a specialist CCG that has extra freedom to prescribe certain antifungals, and some transplant units may prescribe antifungal prophylaxis. Phase IV Also known as post-marketing. Checking that the drug performs as well as expected in a 'real world' setting. As you can imagine, it is difficult to say with any certainty how long it will take for new drugs you may have heard about to be available in clinic. We discuss the latest developments in our monthly patient and carer meetings, which you can watch here. What new drugs are currently in trials for aspergillosis? New drugs are usually approved for invasive aspergillosis before CPA/ABPA. F901318 (olorofim) is a novel antifungal from a completely new class of drugs (the orotomides). It is being developed by F2G Ltd, which is a spin-off company whose advisors include Professor Denning. F901318 has been through various Phase I trials and has recently (July 2018) entered a Phase II trial to see how well it works in 100 patients with invasive fungal infections who do not have other treatment options. Clinical trials must be registered publicly for ethical reasons (because they involve human subjects). 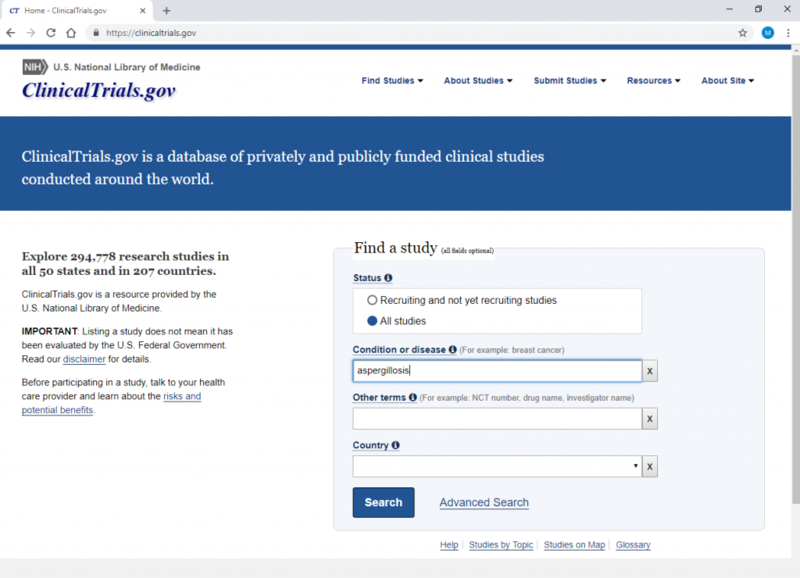 You can use clinicaltrials.gov to search for trials that you might be eligible to participate in, or to find the results of trials that have recently been completed. If you aren’t comfortable with the risks involved in testing a new drug, you could volunteer for a registry or diagnostics/biomarker study instead. Many trials look at how we can use existing drugs in new dosages or new combinations, or in different groups of patients e.g. ATCF: Itraconazole/voriconazole for cystic fibrosis patients whose sputum is persistently positive for Aspergillus.